Simonas gata: Ah, costume dramas! One of my more timeconsuming interests is watching movies and tv. I can't tell you how much I love to find new series that I haven't seen and then just "binge watch" and se all the episodes in a short amount of time! Also, I tend to go for different types of genres depending on mood but I am always a big lover of costume dramas (a term that I use loosely for movies and tv-series that depicts older time periods and who's stories usually consists of love, war and betrayal). Both old and new ones and also good and bad ones! Now that it is january wich in Sweden is one of the most boring months I thought I'd make you guys a little list with tips of some of the tv series I've seen recently. Remember though that I comment these series according their genre. Maybe you have already seen them? Tell me what you think! And if you haven't, please do and get back to me! Costume excess! Can't tell you how many gorgeous pieces the caracters are wearing! One of my favorites is an amazing dress with coloured fur that Irene Forsyte wears in Paris. Also, it has all the things a classic drama should have. Love, deception, family feuds, sorrow, guilt, antagonists..you know, the whole shebang! The Forsyte saga spreads over a number of years (1870-1920) and you get to follow the upper-middle-class british family Forsyte as they grow up and then have kids of their own. I must say that the story sometimes feels a little bit too predicdable but in some ways that is part of the genre. Best performance is definitly by Damien Lewis who plays Soames Forsyte. I just love the way he uses his bodylanguage and how it gradually changes as he get's older and . Perfect to watch a sunday afternoon when there isn't much to do. This cozy mini-series is about Amanda who loves Jane Austen and in particular her book "Pride and Prejudice". She has read it numerous of times and knows the story by heart when she suddenly has the (un)welcome oppurtunity to visit and live in the world of Austen. You wont find amazing costumes in this one, the clothes are quite low key and I couldn't help getting annoyed with Amanda who trough the whole series has her hair down in a "modern" haircut when that would be the easiest part for her to change. Well, small potatoes. This isn't breathtaking but definitly reliable and warm, the story putters along through the episodes and sometimes that's just what you need. Not at all as glamorous as The Forsyte saga but instead heartwarming and nice. 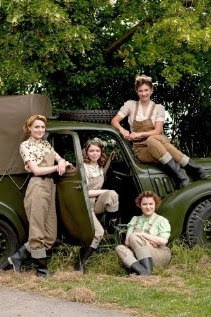 This is a story about four women who for different reasons joins the Women's Land Army during world war II. They come to work at the Pasture farm that is a part of the Hoxley estate where you also find Lord and Lady Hoxley. And even if the story is set at the English countryside the war is very present and defines the characters life's. The most glamorous of the four is Nancy Morell who wears big victory rolls and comes in to question due to her italian heritage. But my favorite is the goodhearted Joyce Fisher who works hard at the farm when her husband is off fighting for the country. If you want to see something that isn't too dramatic but still to depicts historic events in a different way, this is perfect! Hair (and clothes) envy! This beautiful little series is about Sir Hallam Holland and his wife lady Agnes who in the 1930's moves in to 165 Eaton place in London. Wich is where the Bellamy family lived in the older "Upstairs, Downstairs" from the 70's. The series starts with them settling in and finding the staff that is needed to keep such an household a float. 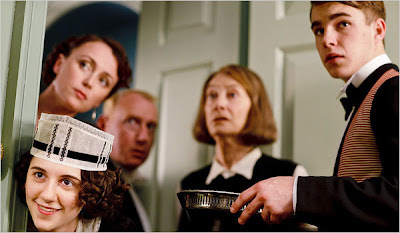 Then we follow both the "downstairs" family, the cook, butler, servants and so on and of course the "upstairs" family who gets thrown into the political prelude of the second world war due to Sir Hollands diplomatic work. The series covers both the smaller matters of living together under these conditions to bigger problems as how to cope with war and choosing sides. The best dressers are definitely lady Agnes and also her restless sister lady Persie who later joins them at the house. In it's genre the story is good and I love that nobody is portraid as perfect, in that sense, the characters are human. Hope you found something new to watch!